Everything you need to know about downtown Miami's first shopping mall, Brickell City Centre (701 S Miami Ave). 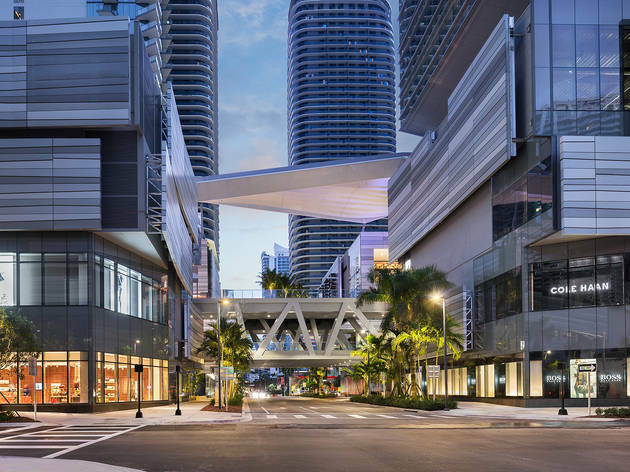 Downtown Miami’s first shopping mall is as architecturally impressive as it is massive, boasting a 107,000-square-foot Saks Fifth Avenue—the first to open in Miami in 30 years. The multi-level retail complex is filled with big-box stores, brands new to the U.S. like Italian label Boglioli, a slew of restaurants and a luxury dine-in movie theater. Spanning more than four blocks in the Brickell neighborhood of downtown Miami, Brickell City Centre is easily accessible by car, foot or via public transportation. It features an underground garage that offers two hours of free parking for guests and a designated Uber drop-off location. Plus, it's less than two blocks from the Brickell Metrorail station and adjacent to bus and trolley stops. In addition to retail, Brickell City Centre boasts an impressive roster of restaurants helmed by some of Miami's top culinary talents. Pubbelly Sushi has their first mainland restaurant on the mall's top floor, as does Tacology, an offshoot of Mexican restaurant Cantina La Veinte. American Harvest, Luke's Lobster and Dr. Smood juice bar are among the mall's most popular fast-casual concepts. 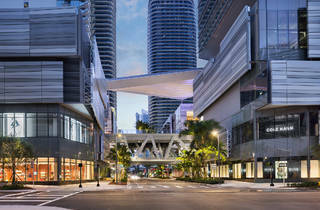 Retail stores run the gamut at Brickell City Centre. You'll find high-end department store Saks Fifth Avenue and a spacious Intermix boutique as well as a Victoria's Secret store and Bath and Body Works. Italian perfumery Acqua di Parma has a store here, as does Apple, Sephora, All Saints and Adolfo Dominguez, just to name a few. Brickell City Centre has more than four floors of retail spaces selling clothes, shoes, accessories, home goods and more. Looking for a place to set up your new business? Shared workspace company WeWork opened its third Miami location inside Brickell City Centre in the spring of 2017. A few months later, Drybar, a national chain of blow-dry hair salons, opened its second Miami outpost here. If it's entertainment you're after, check out Mexico's CMX Cinema. The luxury, dine-in movie theater features a full food and drink menu—giving guests the ultimate dinner-and-a-movie experience in one place. Our Time Out Miami editorial team is constantly updating and reviewing the best attractions, activities and venues across the city, so that you're always in the know, with the best of Miami at your fingertips. Brickell City Centre was most recently updated with new tips on June 28, 2017.